I’m getting board stuck in this house. I’ve got a brand new camera and I’ll I’ve got to take pictures of are my cats. Let’s just say my wife and daughter are camera shy. I’ve got two cat’s. I spotlighted Clyde the other day and this is Sophie. She was hiding under a pillow on our bed. She does this sometimes but I was ready for her when she did this today. Eighty percent chance of rain tomorrow so it looks like I’ll be stuck in the house again tomorrow. Doctor appointment on Tuesday and I might get to go back to work on Wednesday. Not really looking forward to that but at least it’s something to do. 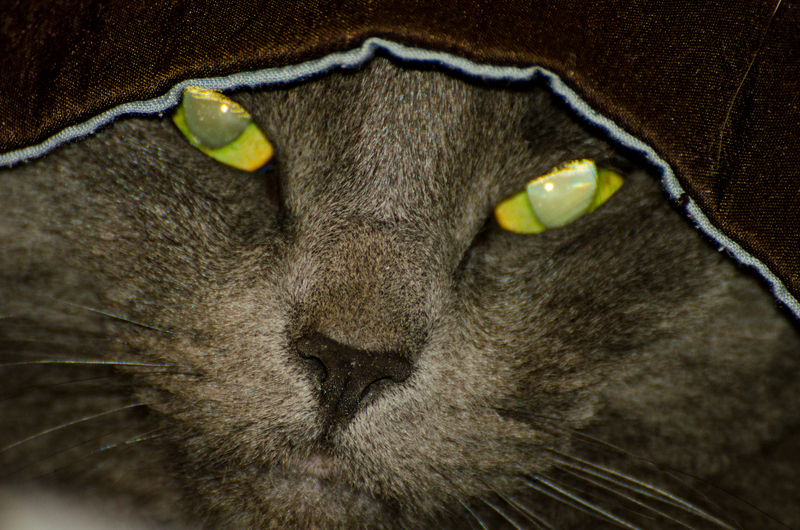 Today’s photo is of one of our cats, Clyde. Clyde is a nine year old male and weighs about fourteen pounds. He is the master of our household, or at least he thinks he is. He will not let my wife sleep in. He will get on top of her and yell until she gets up to feed him. This usually starts around 6 am in the morning. If she stays in bed too long he will eventually leave a gift of pee somewhere in the house other than his litter box. Clyde is one of two cats that live with us. His sister, Bonnie, died a few years back with a heart attack, or so the vet says. About a year later we acquired another female cat named Sophie, a cat with a completely different demeanor.